Let’s get right to the point. Sully bored me to tears. The movie that is, not the pilot for whom I have the utmost respect. I have to make that abundantly clear so I’m not misunderstood. This production is simply not artfully designed to maximize entertainment value. At least not as far as this reviewer is concerned. But what do I know? Sully continues to astound as the #1 film this weekend with another $22M. I shouldn’t be surprised by its success. This is an old-fashioned tribute to an American hero by director Clint Eastwood starring Tom Hanks. It’s the kind of crowd-pleasing subject with a starring role that couldn’t miss pressing all the right buttons if the drama had been constructed out of a marketing focus group. In some ways, that feels like part of the problem. Sully is a biopic about the actions of one Chesley “Sully” Sullenberger, the pilot of US Airways Flight 1549. Back in Jan 2009, the airliner hit a flock of Canada geese only 100 seconds into the flight, disabling both engines. Determining that no airports were within a safe distance, He made an emergency landing in the Hudson River. The entire dilemma occurred and was resolutely solved in 208 seconds. All 155 passengers and crew aboard were saved. Sully was immediately hailed as hero. The incident came to be known as the “Miracle on the Hudson”. Case closed. End of story, right? Not so fast. How do you create meaningful tension in a tale with a central issue that was quickly solved and with a happy ending to boot? Clint Eastwood is often captivated by downfall and redemption themes. Therefore, he has retrofitted his aesthetic to manipulate a story where there really is no conflict. I’ll admit there’s excitement in a crash landing, or what could have been a disaster. Drama resides in human fear. Except that’s not how Mr. Eastwood approaches this topic. The crisis has already happened when the chronicle begins. Instead of concentrating on the incident itself, Eastwood tries to mine thrills by fashioning the plot around an inquisition by the National Transportation Safety Board. They believe Sully had enough power to safely return the plane to LaGuardia or land at Teterboro airport in nearby New Jersey. The movie flashbacks to the roughly 5 minute ordeal over and over again as details emerge. Each side contends their own side of the truth. I thought of Inherit the Wind and the way “right vs. wrong” was amusingly portrayed in a courtroom setting. It’s all about the “I bet you feel like an idiot now!” moment. I’m not here to debate whether the NTSB really was the villain in this ordeal. (For the record, they gave Sullenberger high marks in their accident report and publicly credited his quick action that saved lives.) I just want an engaging flick. Sully, however, is a deferential hagiography that manufactures the final payoff out of a series of dreary flight simulations in a room full of people talking. This becomes the weak climax of an account where the ultimate showdown is a big yawn of a discussion. Chesley “Sully” Sullenberger is unquestionably a hero. No one disputes that — or no one but the NTSB according to this script. In any case, this feature chose to depict a 5-minute event that had a happy ending. It’s not easy to make that exciting. This film proves that. Even at a scant 96 minutes, the drama feels overstuffed with filler. This entry was posted on September 18, 2016 at 4:55 pm and is filed under Biography, Drama. You can follow any responses to this entry through the RSS 2.0 feed. You can leave a response, or trackback from your own site. Great story and an even better direction from Eastwood. Nice review. I liked American Sniper more. I guess what made it work for me is I thought Sully was a compelling enough character with his dealing with the media and PTSD. Plus the films commentary on our need for heroes I thought was gripping. 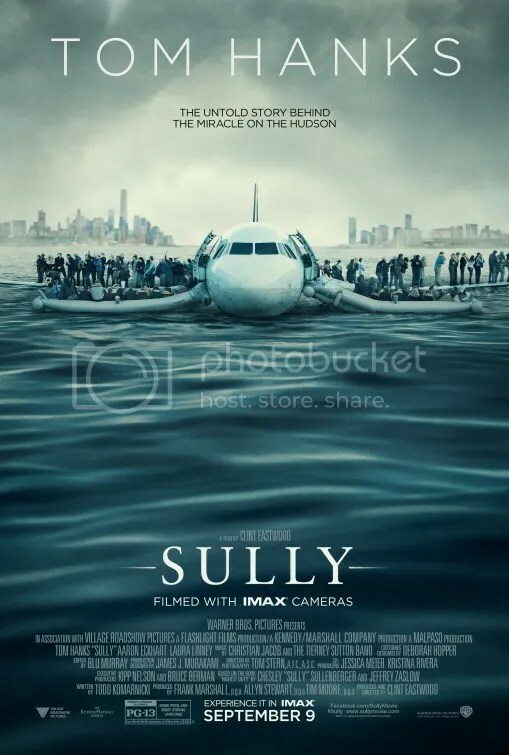 The plane crash was repetitive but I still liked the movie very much but can see your POV if you didnt find Sully engaging character. I also liked American Sniper better for what it’s worth because I felt that had something new to say about the house to house style of modern war. This was more commercial and less controversial but I still liked it. That’s where director Clint Eastwood / screenwriter Todd Komarnicki bungled the movie for me. Instead of focusing on Sully the man, who is inherently an interesting character, the entire movie revolved around this investigation with a climax highlighted by a bunch of flight simulations in a conference room. It’s a very strange approach for a movie about an emergency plane landing that happened in the Hudson. At heart, this is a rather simple story with a happy ending. I liked American Sniper a little more as well. Although I’m not sure it’s less controversial. Apparently the portrayal of the NTSB in this movie as the villain was a complete fabrication. Naturally there was an investigation. That did happen. I’d be shocked if there wasn’t after such an event, but in reality the NTSB were very pleased with Sully’s work. That doesn’t lessen my enjoyment of the movie. Movies play with the truth, but the manipulation of facts certainly doesn’t help. The thing I found more confusing then making a movie about this ordeal is why was it filmed in Imax. I do want to see this , but it doesnt look like something I want to see in a theater, maybe an airplane. I think Eastwood said it was framed with Capt.Sully’s state of mind and thoughts at that time which validates the film for me. They definitely pushed the ntsb part, but then again film is an art so I’m ok with that. Nice review anyways and I totally get the repetitive nature and trying to squeeze something out of a largely resolved matter. It was boring, but I never said it was repetitive. The poorly written climax of flight simulations in a conference room was a dreary way to end a film. I liked the plane crash material. I’d love to see Hanks play a different role, as great as he is. I can’t ever really remember him playing a bad person in a movie. He was a villain in The Ladykillers but it was mainly played for laughs. I’ve heard Road to Perdition too, but his hitman character was such a devoted family man, I wouldn’t count this as a bad person. The redmption storyline also negates this idea. Bummed to hear you were bored by Sully. I missed it when it came out, but I’ve been looking forward to seeing it. I liked the idea of an old fashioned tribute to an American hero directed by Eastwood and starring Hanks, but I also thought that its premise of him being interrogated despite his heroics seemed fascinating. Seemed like there could be solid drama about how people question themselves in situations like that even when they go right. The biggest criticism I’ve heard though (and you mention it here) is that the drama feels manufactured and the villain (the NTSB) is forced. I could see how that would be boring, so I don’t blame you for feeling that way. Sully has its moments but pretty mediocre overall. Oye! Boring…..this should have been a made for TV movie. The only part that captured my attention was the actual plane landing and passengers being removed. Other than that, I was just waiting for some excitement. My Fitbit tacks my sleep and recorded me being asleep the entire hour and a half. Lol. 2 stars. Even though you weren’t asleep…..just very very relaxed.